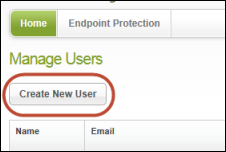 If you have Admin permission for Endpoint Protection (see Setting permissions for portal users), you can create new Management Portal users, set access permissions for them, and edit their information. When you create new users, Endpoint Protection sends them an email with further details for creating a password and logging in. You might want to add other administrators so they can access Endpoint Protection reports. You can also add users with limited permissions so they can view data, but not make changes. In the Manage Users panel, click Create New User. In the Create New User panel, enter the user's email address (the address where the user receives the confirmation message). The email address will also serve as the user's login name. If you entered the wrong email address and the user does not receive the message, you will be able to change the email address and re-send it later. See Editing user information. Select the time zone where this user is located. Click the pencil icon at the right, then type the country, region, or city to open a drop-down menu of choices. Next to Do you wish to give this user Console access?, click in the Yes checkbox. Additional fields appear at the bottom, as shown in the following example. SecureAnywhere: The Home page of my.webrootanywhere.com (see the following example). From here, the user can access other Webroot portals, such as the Mobile Protection portal, if your company purchased Mobile Protection. For more information, see the WSA Business - Mobile Protection Admin Guide. Endpoint Protection: The Management Portal (or Admin Console) for Endpoint Protection. When users have access to this portal, they will see the Go to Endpoint Protection button and can click it to enter the Management Portal (see the following example). 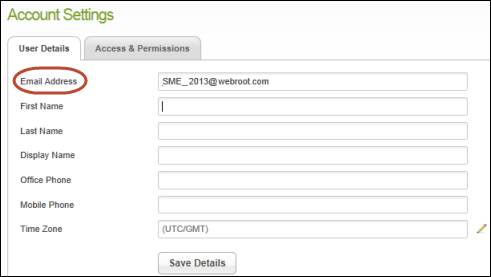 In the SecureAnywhere field, click the drop-down arrow to select either Basic (limited access to consoles and account settings) or Admin (full access to all keycodes, users, and account settings in Webroot portals). In the Endpoint Protection field, click the drop-down arrow to change No Access to either Basic (read-only access to endpoint scans) or Admin (full access to all settings). You can further modify this user's permissions later, as described in Setting permissions for portal users. When you're done, click Create User to send a confirmation email to the new user. The user's email message includes a temporary password for the first login. 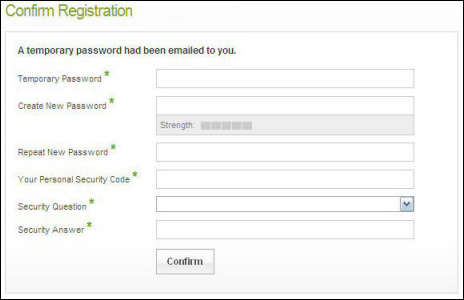 When the user clicks the confirmation link in the email, the Confirm Registration panel opens for the user to enter login information (see the following example). Note: You can deselect the Use Security Code during log in checkbox to allow users to bypass this portion of the process when they log in. For more information, see Editing Your Own Account Settings and Editing Site Admin Settings. If the user has not confirmed registration, you will see the user's status as Awaiting Confirmation. The status changes to Activated when the user receives the email and confirms the registration. If desired, you can resend the confirmation email by clicking the envelope icon next to the Awaiting Confirmation status. Note: If your account has multiple consoles, you see only users who are associated with the keycodes for the currently active console. For more information about consoles, see Adding consoles to your account. In the User Details panel, make the desired changes to the name and phone numbers. If the user has an Awaiting Confirmation status, this dialog shows an email field at the top. You might want to change the email address if you entered an incorrect address for the user and need to resend the registration. If you want to change the settings under Access & Permissions, see Setting permissions for portal users for further instructions.